Information: ALL the declarative statements below should be prefaced with "IMHO" (In My Humble Opinion)! These opinions were developed during the "good old days" in the mid 1980s when I was actively experimenting with making a few dozen plastic kavals out of plastic pipe, which is available in a wide range of diameters and colors. The first revision of this information was written back then, and a few thoughts have been added over the years as different people have asked or commented. Even though I believe them, some of the opinions expressed below are sure to be wrong because of my limited experience in this field. But hey, it's worth what you pay for it! I'm still playing one of the plastic kavals that I made back in the mid 1980s, and it's sound compares favorably with all but the best of the "real" kavals. It was made out of CPVC, a high temperature, tannish colored plastic with a larger inside diameter than most of the standard white PVC pipe. (CPVC is designed to mate with standard copper pipe, and is not available in all states due to building code restrictions.) Be advised that diameter will vary LOTS within a batch of pipes in any given store so get a measuring gauge! My kaval was made with a 17mm diameter pipe with 8mm holes beveled from the top. 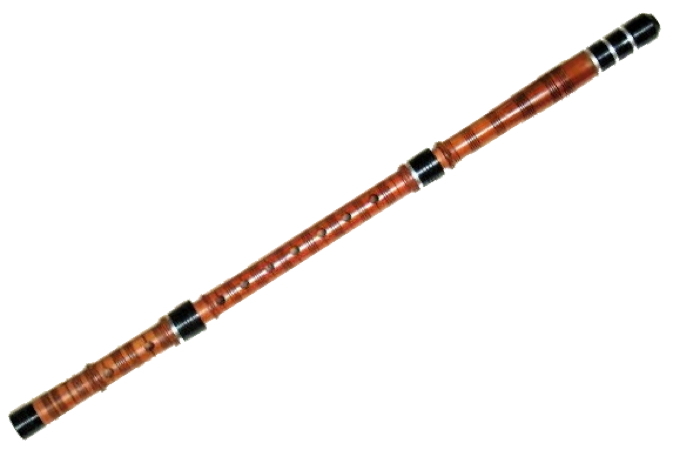 The relatively large bore gives an easy "kaba" sound (low sound), but is hard to play above 'G' in the highest register as a result. Oddly enough, the positions of the finger holes don't "care" about the pipe diameter (to a first approximation...). Another way of saying this is that a 12-millimeter diameter Macedonian style "C" kaval, and a 17-millimeter diameter Bulgarian style "C" kaval could have the holes placed at very similar distances from your mouth, in spite of the large percentage difference in pipe diameter. What does matter LOTS is the ratio of hole size to pipe diameter, and the shape of the holes. In general, a smaller hole closer to the mouthpiece will have the same pitch as a larger hole farther from your mouth. Beveling the hole from the top or the bottom will effectively make it act larger, due to reduction in the "acoustic impedance." This is where sidewall thickness of the pipe comes into play, as a thicker wall gives you more room to bevel and change the effective size of the hole without making it too big to cover easily with your fingers. The added volume of the holes in a thick pipe "colors" the sound by adding a small "chimney" effect, slightly increasing the length and volume of the vibrating column of air. The larger the hole/pipe diameter ratio, the better the approximation to an acoustic "termination" of the sound wave (ideally, an open end of a pipe), and the more closely the overblown series will be in tune. But larger holes are harder to cover with your fingers, and give different effective lengths for the higher harmonics that color the tone. As far as the sound goes, the material of the tube itself is a "don't care," as long as the interior surface is equally smooth. Wood, horn, plastic, and metal kavals of like dimensions will all make a very similar sound. The thickness of the pipe wall is also a "don't care," except for the tuning effects mentioned above. This is another way of saying that the pipe itself doesn't participate in the making of the sound — it's way too heavily damped by your fingers — just the column of vibrating air. Finally, the shape of the mouthpiece has almost no effect. Cuts of 30, 45, and 60 degrees will all sound similar, as will straight or curved blowing edge bevels. Pick a shape you like, but don't make it too sharp or you will hurt your lips. You can stand on a piece of sandpaper, and roll the end of the pipe against it at the proper angle to make the edge. You'll need to make 12 holes in the pipe to make a Kaval, of which 8 are to be covered by your fingers, and 4 are for tuning and looks. Most makers seem to place the 4 tuning holes where the next 3 lower notes would be, if you had more fingers, though this seems to vary lots. (If you want to make a kaval with a lower pitch than the one you start with, the tuning holes are a good guide for where to put the additional holes.) Finished hole sizes between 7 and 9 millemeters are pretty typical. Here's a list of distances for the holes that will get you close to making a "standard" D Kaval, called "RE" by the Bulgarians. It's called this way because the lowest note is "D" when all 8 fingers are down, "RE" in the do-re-mi sequence. The distances are from the blowing end to the center of the hole, in millimeters. Take any pipe of reasonable diameter. Mark the spots measured from the list above, or from a favorite kaval. Bevel the mouthpiece blowing edge to taste. Drill 5-millimeter or 6-millimeter holes, or about 3/4ths the size of your target wooden kaval to start. Play long tones into a tuner, and notice that everything is flat. Enlarge one hole at a time a LITTLE BIT (finger holes only!) starting with the holes farthest from your mouth and work up! Repeat steps 5 and 6 until you're in tune or tired. The motivated will consider gingerly enlarging the 4 tuning holes at the beginning and maybe even a bit more at the end of the above process. If you're in a hurry, replace steps 4 to 8 with "Drill an 8 mm hole at each spot." While you are playing the long tones to tune, you will probably notice that you can "bend" the notes LOTS — a quarter or even a half step! This is one of the features of the kaval that endears kaval players to their fellow musicians. Forceful blowing and pulling the far end of the pipe close to your body will sharpen the pitch; blowing softly and pushing the far end of the pipe away from your body will lower it. Keep this in mind when you are measuring and drilling. A strong and constant embrasure helps lots. If you want joints, you'll have to work with some scrap pipe to find out how much material to remove at the cuts as each joint will change the length of the pipe significantly. Be especially careful with the joint near the thumbhole, as it's real easy to cover the thumbhole with the standard plastic slipjoint that's used to join pipe. Sawing with a fine pitch hacksaw is an easy way to get a reasonably precise cut. As the saying goes, "measure twice, cut once."